Running Y Townhouse Rent our beautiful golf course view Running Y Townhouse! 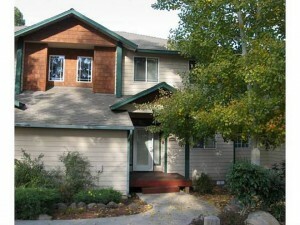 Looking For The Best Running Y Ranch Vacation Rental? Looking For Running Y Vacation Rentals? Check Out Our 3 bedroom 2.5 bath Running Y townhouse overlooking the Arnold Palmer designed Running Y Ranch Resort golf course. That picture just above these words… the one of the golf course… is the view out the master bedroom in our townhome… and we’d love to share our vacation home with you! Our family bought this 1500 sq foot townhouse at the Running Y in 2013 and we put a lot of time and energy into making it what it is today. The reason we bought this particular unit is the view. From our large back deck you’ll see expansive views of the Running Y Resort and the golf course below… and when you mosey upstairs to the master bedroom… the view opens up even more! … 1500+ square feet, 3 bedroom and 2.5 baths with a master suite that includes a flat screen wall mounted TV, large soaking tub, shower, and spectacular views from every corner of the master suite. The other two bedrooms both have queen beds as well and share a full bathroom. This townhouse includes a gas fireplace you’ll enjoy as you cozy up in the living room. Just off the living room you’ll find the dining room that has a table that’ll comfortably seat 4 as it is… or expand the table to seat 6 if you have a larger group. The kitchen comes fully stocked with everything you’ll need during your stay to whip up great meals (except for the food of course :-). 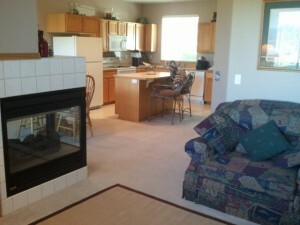 This unit offers FREE wifi and cable TV as well! So if you plan to use some of your time to get a bit of work done… or just want to surf the net while you’re here… we’ve got you covered. 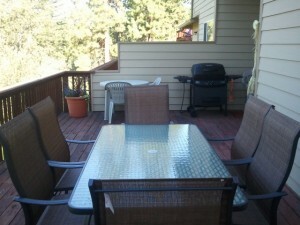 Off the back side of the townhouse you’ll be able to enjoy our large wood deck. BBQ up some steaks (BBQ included) and hang out on the patio furniture and enjoy the view (mornings are awesome on the back deck with a cup of coffee or a Bloody Mary!). Picture I took just outside the main lodge at the Running Y. Included in all stays over 3 nights you’ll receive passes to the fitness center which includes the swimming pool, sauna, fitness room, and more! There’s lots more info about our Running Y Townhouse… like our seasonal rates, the calendar so you can see if it’s available when you want it, and you’ll be able to see more pictures too… just click the big link below to go to airbnb.com which is the service we use for booking and taking payments. We hope to chat with you sometime soon and look forward to sharing our townhome with you! Book Our Running Y Vacation Rental! “Must visit golf course in Oregon! – The Running Y Ranch, located in Klamath Falls, OR is a must-visit resort course, and the only golf course designed by Arnold Palmer in the state of Oregon. 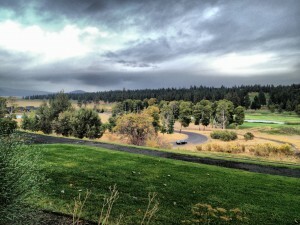 The golf course is the crown jewel of a 3600 acre ranch just East of the Cascades.